Extrupet, the biggest polyethylene terephthalate (PET) bottle recycler in South Africa, has started up the country’s first bottle-to-bottle (B2B) recycling plant. 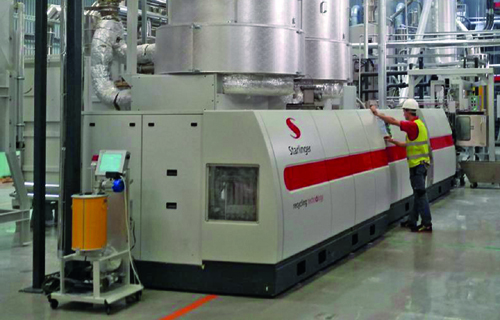 Featuring Starlinger’s iV+ technology, the plant produces PhoenixPET, a recycled PET (rPET) brand approved by The Coca-Cola Company. The 3,000sqm PhoenixPET plant in Johannesburg, South Africa, was inaugurated on May 11, making the country the first one on the continent to use rPET for Coca-Cola products. It will divert an additional 22,000 tons of post-consumer PET bottles from landfills each year and create income opportunities in PET bottle collection for an estimated 15,000 people, according to Starlinger. The PET recycling line, a recoSTAR PET 165 HC iV+, is designed for producing food grade recycled PET pellets according to the US Food and Drug Administration (FDA) and the European Food Safety Authority (EFSA) standards. Extrupet’s PET recycling extruder is also equipped with an in-line quality control system that monitors the color and intrinsic viscosity (IV) of the produced pellets. In addition, an online color spectrophotometer constantly measures the color values, ensuring uniform color of the rPET and reducing off-spec production. The recycling line automatically adjusts operation parameters to reach the desired IV level after it has been set on the control panel. During production the IV level is monitored permanently and parameters readjusted if necessary. This avoids IV variations after the extruder and guarantees very constant IV values already during pellet production. The melt quality of the extrusion is ensured by pre-drying of the input material (washed bottle flakes) as well as high-vacuum degassing and melt filtration. In the downstream inline SSP reactor the IV level of the produced pellets is increased to the desired level. Organic and volatile components and acetaldehyde are removed. The FIFO (first-in first-out) treatment of both the flakes in the dryer before the extrusion process and the pellets in the continuous SSP process after extrusion improves consistent residence time. For thorough quality control and traceability, the recycling line is equipped with an online archiving system of process data.